Have you used the ‘Talk’ area of your favourite Zooniverse project? Talk is a discussion area where you can comment on the images you have been classifying and interact with other volunteers who are taking part in the same project as you. Pretty cool huh? The majority of our projects have a Talk area, and we find that more than 10% of our volunteers make comments there. You can also use it to do a lot more, like keep collections of your favourite images and search for different tags. 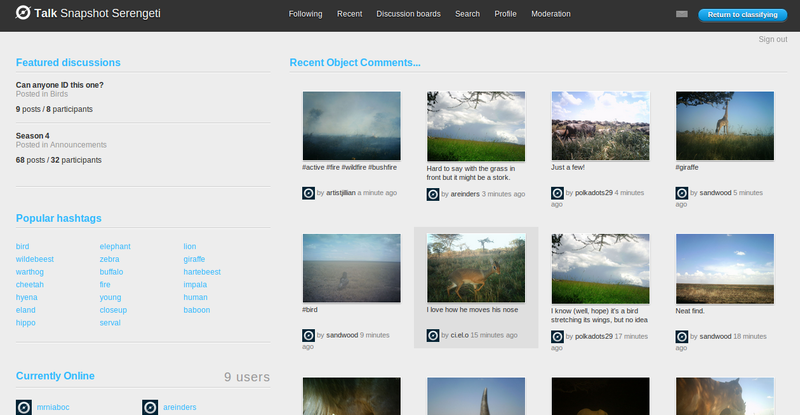 For example, you can see all images on Snapshot Serengeti that have been tagged with the word ‘beautiful‘. Have a play around on the Talk area of your favourite project now!